The restructuring continues at Edgbaston. Following relegation from Division One of the Specsavers County Championship, Warwickshire have announced that New Zealander Jeetan Patel will take over the captaincy of the Club in 2018. When Ian Bell resigned the captaincy, towards the end of the 2017 season, Jonathan Trott took over the leadership of the four day team and Grant Elliott led the Birmingham Bears to the final of the NatWest T20 Blast. Elliott will continue at the helm of the T20 team, but it seems clear that the Club would prefer Trott (and, for that matter, Bell) to be focussing on the primary task of scoring mountains of runs. Intriguingly, Dom Sibley who joined the Bears from Surrey part-way through the 2017 season has been named as Vice-Captain and is clearly being groomed as a future leader. Jeetan Patel (37) initially joined the Bears in 2009 and has been the overseas player across all formats since 2012, during which time he has helped the club win all three domestic trophies, including the County Championship (2012), NatWest T20 Blast (2014) and Royal London One Day Cup (2016). Patel has taken 353 First Class, 102 List A and 113 T20 wickets for the club and was named as the PCA County Most Valuable Player in both 2014 and 2016 and runner-up in 2017. Ashley Giles, Sport Director at Warwickshire CCC, said: “We’re thrilled to have Jeetan returning to the club in April as our captain. “He’s a true Bear, who has sets exceptionally high standards on and off the pitch. Jeetan Patel said: “I absolutely love playing for Warwickshire and it’s a great honour to return to Edgbaston in 2018 as club captain. When you look at the guys who have captained the club over the years and what they have achieved, it is amazing to go on that list. 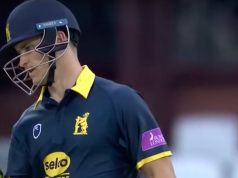 Dom Sibley (22) arrived at Edgbaston in August and made an immediate impact in T20 cricket, by scoring 191 runs in seven games to help Bears to the Final of the NatWest T20 Blast. He also scored 310 runs in six County Championship appearances. He is currently in Australia playing Grade Cricket. Giles added: “Dom made a significant impact after joining the club at a difficult time last season, and we saw some real fight and character in the innings that he played. Elliott (38) joined Birmingham Bears last season and scored 332 runs and took 12 wickets in the T20 campaign, and took over the captaincy ahead at the end of the group stages before leading the club to the final. “Grant is a hugely accomplished T20 cricketer,” said Giles. “He’s played in the best competitions around the world and he knows exactly what it takes to win in highly pressurised situations, as we saw with his captain’s innings in our quarter final victory over Surrey at The Oval. Most Bears fans will be pleased that, since the middle of the 2017 season, so many changes have taken place both on and off the field at Edgbaston. Ashley Giles as Sport Director and Neil Snowball as Chief Executive are clearly intent on shortening the transition period that all successful teams experience in moving from one generation to the next. In addition to Sibley, other new players – Adam Hose, Ryan Sidebottom, Will Rhodes – have arrived and Graeme Welch has returned as bowling coach. Young players such as Ed Pollock and Aaron Thomason have been blooded in the first team. The appointments of Patel, Elliott and Sibley complete what many would accept as a much-needed shake-up. Whether overall the Club has made the right decisions will begin to become apparent once the players get back on the field in 2018.